Get more from a postpaid plan as one of the biggest network here in Philippines offer 3 gadgets in 1 plan. Sun Broadband Plan 999 gives you TRIO bundles where you can get 2 tablets and 1 Pocket Wi-Fi. An extended Christmas offer from the cellular network that claims to have the consistent, fast and reliable internet connection. 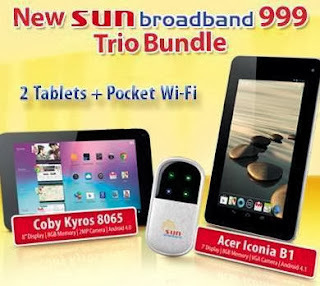 You can own this 8 inch Coby Kyros 8065 and a 7-inch Acer Iconia B1 tab plus the pocket Wi-Fi for only 999 pesos a month. No just that sunny guys, you can also get free surfing up to 80 hours without initial cash out. Are you internet? See Requirements on how to Apply Sun Cellular Postpaid Plan. This TRIO plan has more options or denomination that you can choose depending on your wants and lifestyle. We'll put details on each of the plan below starting from Plan 999, Plan 1299, Plan 1399 and 1599. If you can recall their previous where they bundles a laptop at Samsung ATIV free at Plan 999, they also include a laptop under TRIO Gadget Plan 1299. Find out the details below. If you want unlimited surfing on this plan with same bundles, you can apply for Plan 1399, which is only good for 24 months lock in period, or you just avail additional surfing via Sun PowerUp Add-On. If you want unlisurf with same gadgets, you can apply Sun Gadget Plan 1599 that comes with unlimited internet browsing on the bundle Pocket Wi-Fi. For more details, you can visit www.suncellular.com.ph or go to your nearest Sun Shop.